For the challenge at So Artful Challenges. 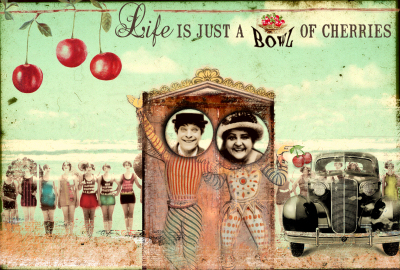 Theme this week is "Life is just a Bowl of Cherries"
delightful! i just love your work! so whimisical and fun!! This is fabulous, how fun! What a fabulous take on the challenge. It is so much fun. Very nicely done. Thanks for being Soartful this week. Love this Julia - its such fun! This is so cute!! Great job!! Yes! This is a picture that makes one happy! Lovely images! Fun, fun! My thoughts exactly!! wow wat vrolijk =) mooie kleuren ook weer! Beautiful job! Really great. Love the colors and the old feel, but with such a creative touch! Oh wow this is fun. Wat een geweldige dingen heb je weer gemaakt, echt super!! Delightful, magical, whimsy and fun! So lovely! I just adore it! Mmmm, have to say it's one of my fav's. So nice to come by and bask in your enchanting work and ideas - hope it rubs off. This looks so fun! Definitely what I think life as a bowl of cherries would look like ~ You captured it greatly! Blessings! this is just classic...such wonderful fun!